This title is only available to Xbox 360™ owners with an Xbox LIVE Silver or Gold membership, through download from the Xbox LIVE Marketplace. ToW is a straight forward racing game in the RC genre. Best described as "a tribute to ReVolt". The arcade side is reinforced by a simple pick up system. Any racing fan will appreciate state of the art car physics and dynamics of ToW competitive racing. 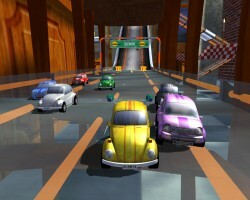 Extra races add to this racing game's fast-paced action. Play with friends on a split-screen, and gather up to 12 crazy achievements. Crazy arcade racing: ToW is a racing game that will make you scream for more. Take your favourite RC car to race inside the house and around the park, have fun with your friends or compete to victory. Use bonuses to bend the race to your advantage. Don’t be afraid to get ToWed! Fun racing: Twenty races, one gigantic house and 12 original achievements will keep you racing and going for gold. Cool options: Twelve original cars, each with their caracteristic and 4 different power-ups, keep the racing fresh. Multiple modes: There are lots of ways to play including Arcade (both Solo and Split Screen), Championship, and 4-player Live Mode (even mixing players and AI) complete with in-game audio chat, multiple leaderboards and weekly resets. There is a brand new lobby management to keep you playing with your friends for hours, over and over. Downloads: There's a ‘try before you buy’ version, Gamerpics, themes and several craze-packed downloadable add-ons but we can’t tell you just now.